When looking at bottle capacities, most people don’t take into account the variety of bottle sizes available. 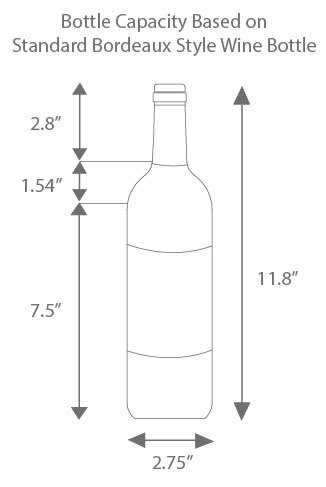 Depending on the type of wine, the shape of your bottles could be completely different. Cabernet Sauvignon bottles have high shoulders, while Chardonnay and Pinot Noir bottles have low, sloping shoulders and a wider base. The bottle capacity of most wine coolers, unless stated otherwise, is determined using Bordeaux-style 750 mL wine bottles.